Jerry Ronald (Ronnie) Raper passed away on April 8, 2018, in Abilene, Texas. He was born in Abilene on January 9, 1943, the youngest child of S.G. and Ora Raper. He grew up in Lawn, Texas and attended Lawn and Jim Ned schools. He married Sue Dean on September 3, 1960. The two lived in Lawn where they raised their two girls, Susan and Vickie. Ronnie was an owner and operator of Lawn Truck Line with his father S.G., until his retirement. He enjoyed working on the trucks as well as driving them. He was a self-taught mechanic and enjoyed working with his hands. He was happiest spending time with his family. 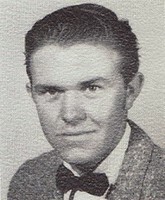 He is survived by his wife, Sue Raper of Lawn; two daughters, Susan Sneed and husband Richard of Schertz, and Vickie Sparks and husband David of La Grange; granddaughter Skye Sneed of College Station; a sister, Sylvia Rose of Waco; sister-in-law, Shirley Haden of Anchorage; brother in-laws Winfred 'Buddy' Dean of Midland, Johnny Dean and wife Reba of Odessa , and many nieces and nephews. He was preceded in death by his father, S.G. Raper, Sr., his mother Ora Raper, brother S.G. Raper, Jr., brothers-in-law Vaden Dean, Jimmy Dean; sisters-in-law Luda Cook and Norma Jean Akeman. Visitation will be on Thursday, April 12 at Fry-Smith Funeral Home in Tuscola from 6-8 pm. Funeral services will be on Friday, April 13 at Lawn Baptist Church at 2:00 pm A short burial service will follow at McBee Cemetery in Ovalo, directed by Fry-Smith Funeral Home in Tuscola. In lieu of flowers, the family requests that memorials be made to, The American Heart Association . My daddy was the strongest, most loving father a girl could ever have. He was quiet but brilliant. I will miss him with all my heart. My mother went to be with him and the lord days afterward. When you thought of my mother, you'd think of daddy. They had to be together with the Lord. I will see them again one day. Amen! I'll always be your 'swamper', Daddy.